I've been holding out on you. I made these cookies for my thesis defense party several weeks ago and haven't gotten around to sharing the recipe until now. I wanted to space out the dessert recipes a bit, but it's been a month since the last one, so I think it's about time for some sweets! The recipe for these cookies came from the Baked cookbook. I had never heard of monster cookies before I came across this recipe, but apparently they are well known in certain areas. 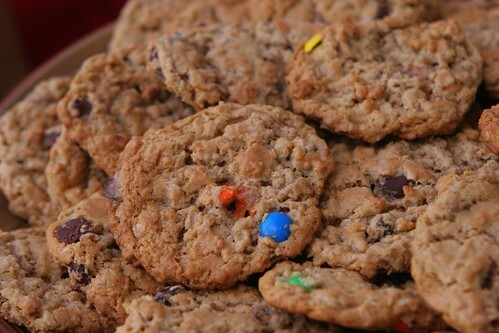 If you are unfamiliar with them, monster cookies are peanut butter oatmeal cookies with chocolate chips and M&Ms. According to the authors of the recipe, they are called monster cookies because they are the Frankenstein's monster of the cookie world - a mashup of different components. (Also, I got 60 largeish cookies when I made this, but the recipe says it yields 36, so the cookies that they serve at the Baked shop must be pretty monstrous in size). Now, I think oatmeal chocolate chip cookies beat oatmeal raisin every time, and I love peanut butter, so mixing it all together sounded great to me! Note that this recipe requires that the batter be refrigerated for 5 hours before baking. Whisk together the flour, baking soda, and salt in a large bowl. Add the oats and mix until well combined. In the bowl of a stand mixer fitted with the paddle attachment, beat the butter until smooth and pale. Add the brown and white sugars and beat at low speed until just incorporated into the butter. Add the eggs one at a time, scraping down the bowl and beating until batter is smooth before each addition. Add the corn syrup and vanilla and beat until just incorporated. Scrape down the bowl and add the peanut butter. Beat on low speed until just combined. Add the oat mixture in three separate additions, beating on low speed each time until oat mixture is just incorporated into the batter. Fold in the chocolate chips and M&Ms with a wooden spoon until well distributed. Cover the bowl and refrigerate the batter for 5 hours. Preheat oven to 375 deg F and line two baking sheets with parchment paper or Silpat mats. Scoop dough in heaping 1 1/2 tablespoonfulls (I used a 1 1/2 tbs cookie scoop) onto baking sheets, placing balls 2 inches apart. Bake cookies for 12-15 minutes, rotating sheets halfway through, until the cookies just start to brown. Cool cookies in the pans for 8-10 minutes and then transfer them to a cooling rack. Cookies can be stored in an airtight container at room temperature for a few days and freeze very well. As noted above, cookies are best after being microwaved briefly. YUMMMM! I don't know of anyone who can resist these cookies- they look AMAZING! I haven't made these from the baked book yet but they've been on my radar...good to know about the microwaving trick since that's how I love my cookies as well!